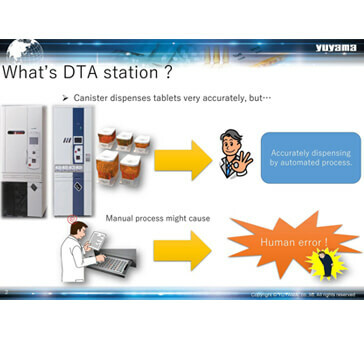 Human error in manual-fills is a very common issue in this industry. To counteract this issue, Yuyama has developed this support system for manual-filling. Users prepare manual medication trays by following the LED lights and on-screen guidance from the connected work station. Users can easily understand where the drugs should be set. With the PIS integrated with our software, only the prescriptions needing manual fills will be sent to the software separately. The customer then prepares the manual medications in advance. 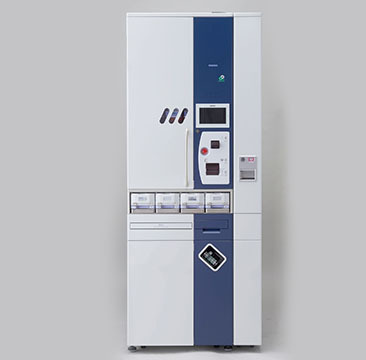 At the same time, the system can print out the list of manually added drugs for added efficiency, improving their overall manual preparation. DTA Station is used as a "pre-pack solution". The scripts are sent to the PROUD, and some of the prescriptions have medications which are is not loaded on the PROUD. For added efficiency, Yuyama's system can divide various scripts by flagging those with manual additions and those without. For those with manual adds,_the user can prepare and fill drugs in advance on the tray. 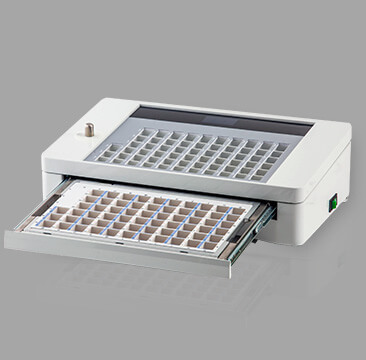 When a prescription with a manual addition is ready, the user simply sets the designated tray into the PROUD. Pharmacists always pay attention to "Human Error" caused by fatigue and high workload. 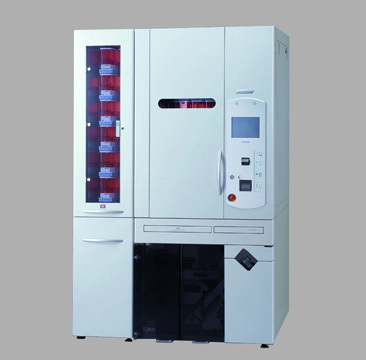 Various devices to automate dispensing tasks were created to counteract this issue.However, manual medications still remains as one of the major factors.This device can prevent users from causing "Human Error". 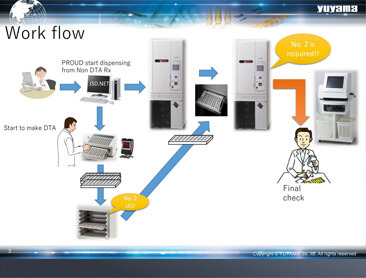 Once the user releases the prescription by batch, Yuyama's JSD.NET processes the order and forwards it to machine and DTA station at the same time. 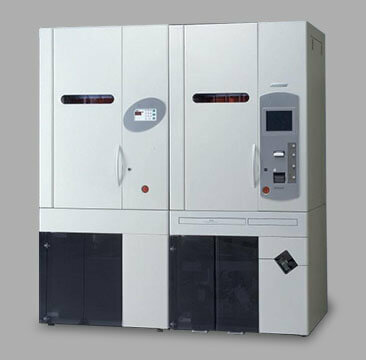 Then, the device will begin to dispense orders which don't include manual-additions. While dispensing the orders, the device prints out the drug list for manual-addition drugs. After picking the drugs for manual addition up, prepare the DTA tray on the station. 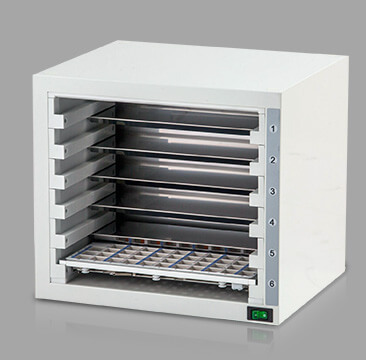 Once the tray is completed, just place the DTA tray into the DTA storage. The PROUD will ask the user to put the designated tray into the DTA station, and the DTA storage will guide you with LEDs to which tray needs to be loaded. Once it is loaded into PROUD, it will begin to dispense for the prescriptions. 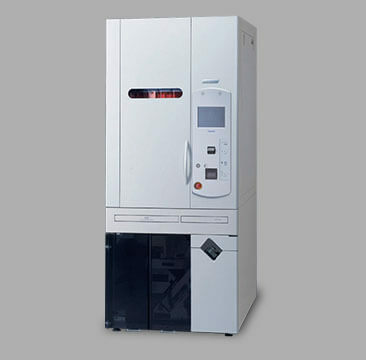 Our software was developed to be the solution for manual fils. 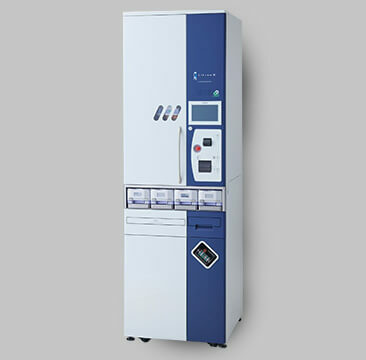 The system shows the set location for each drug and its quantity after being chosen on the screen, reducing the probability of dispense errors. 3. 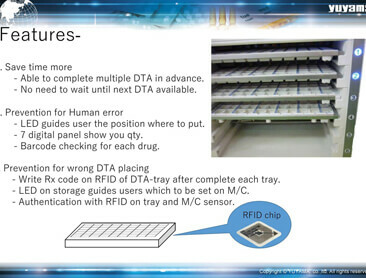 Prevention of Incorrect DTA Preparation -Writing the Rx code onto RFID chip ensures proper dispensing. -Authentication with RFID on the tray and M/C sensor.